A news ticker displays headlines from the meeting of U.S. President Donald Trump and Russia's President Vladimir Putin in Helsinki, Finland on the News Corp building in New York, July 16, 2018. Russian President Vladimir Putin denied having any compromising information on U.S. President Donald Trump and called the idea that Russia meddled in 2016 U.S. presidential elections "utterly ridiculous." 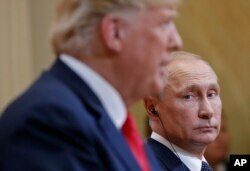 Russian President Vladimir Putin, right, looks over towards U.S. President Donald Trump, left, as Trump speaks during their joint news conference at the Presidential Palace in Helsinki, Finland, July 16, 2018. The interview, which aired Monday night, came shortly after the Russian leader met with Trump in Helsinki for a highly anticipated summit. He also refused to engage with Wallace on the subject of special counsel Robert Mueller's indictment of a dozen Russian officials. Wallace tried to offer Putin a copy of the indictment, which names 12 officials of the Russian military intelligence agency, the GRU. They are being accused of working to hack the servers of the Democratic Congressional Campaign Committee, the Democratic National Committee and emails associated with former Secretary of State Hillary Clinton's presidential campaign in 2016. Putin neither commented on the indictment nor accepted a copy offered by Wallace. Eventually, Putin questioned Mueller's probe, questioning why the former FBI chief hadn't reached out to the Russian government for help in the investigation, pointing to a treaty between the two countries regarding assistance in criminal investigations. "Why wouldn't special counsel Mueller send us an official request within the framework of this agreement?" Putin asked. "Our investigators will be acting in accordance with this treaty. They will question each individual that the American partners are suspecting of something. Why not a single request was filed?" Putin also denied having “kompromat” or "compromising material" on Trump. “I don't want to insult President Trump when I say this -- and I may come as rude -- but before he announced that he will run for presidency, he was of no interest for us," he said. As for the summit, Putin pronounced it "the beginning of the path'' back from the West's past efforts to isolate Russia. "I think you see for yourself that these efforts failed, and they were never bound to succeed,'' he said.